Back on June 18, 2005 with the public launch of Breath of Life, neither my son Mtume ya Salaam nor I would have predicted that Nina Simone would be the most featured artist over the six years of our music website’s existence. Nina is not the most popular artist, although widely known as a famous, some would say “infamous,” diva she probably would not make the top ten female vocalists in a national poll. Nina has not sold the most records. Nina has not won the most awards. Nina has not been the most prolific song writer. Nor has Nina been the most lionized by music critics. There are books on jazz that don’t even mention her. So why has she risen to the top of BoL references? Simply put Nina Simone is black music’s most significant vocalist during the last half of the 20th century. Her work embodied the aspirations and experiences of legions of both fellow artists and audience members. During the critical Civil Rights/Black Power era, Nina defined what it meant to be a black artist and gave defiant voice to the militant expression of Black resistance to oppression and exploitation. Through songs such as “Mississippi Goddamn,” “Four Women,” and “Young, Gifted and Black” Nina Simone sang from inside the skins of frontline fighters for social justice. Professionally, she started as a supper club singer. Her initial hit was a smouldering interpretation of “I Love You Porgy.” But as the times changed, she transformed. Aspects of her life that previously had been kept private were unfurled and flown like a battle flag. Of course, she paid a heavy price, a heavy, heavy price. The repercussions nearly drove her mad. In her latter years she would sometimes rue the choices she had made. (See this short video interview) Nevertheless, the body of work she produced is unmatched by any of her contemporaries or, for that matter, by any who have followed her. Other singers may have made more money but none made more music. Periodically someone will play a Nina song on the radio, or you’ll be watching TV or the cinema and suddenly the unmistakable voice will float forward and grip your psyche by the throat, confronting you with a hard question: my god, what the hell are you doing with your life? Are you living or merely existing? Or you loving or merely seeking pleasure? And that is the ultimate significance of Ms. Simone: she was never playing, never simply entertaining us. Something more profound was always going on. Initially it was covert, subtle but by the end of the sixties, her sound was burning full up; an all-consuming artistic fire. This would then, it seems, be the opportune time to do a retrospective, if not of greatest hits, certainly of milestone moments. That would be a sensible approach. But the safe way is not the road I want to tread in memorializing Nina. Although the Mixtape is called “Classic Nina” what I’m really focusing on is a specific moment in a long and storied career—the moment just before Nina abandoned the United States. Overwhelmed by the violence and death of the late sixties, by the early seventies Nina could stand it no longer and left. On the way out she recorded live a series of concerts that eventually wound up being three LPs, which in turn have now been combined on one CD. The three albums were: Black Gold (RCA 1970), Emergency Ward (1972), and It Is Finished (RCA 1974). This troika of recordings is a holy grail of Black power influenced Nina Simone music. Everything is here: the turmoil and the tenderness, the insights and the rage, the urgent militancy and profound expressions of love. The music on the Mixtape finishes with interview segments taken from a completely different compilation that featured the overtly political songs associated with Nina Simone. I chose one cut from each of the three albums. It is entirely possible, indeed, even probably that few own all three of the original releases, and not many more own the three-in-one CD. But even so, I argue, and I think the evidence of the music supports my argument that this is classic Nina Simone at a major turning point in her life. Back then we didn’t have to wait for 2012 for the rapture. All we had to do was go to a Nina Simone concert and we were swept up, up and away into another state of being. It must be incredible to hear this music altogether as an initial introduction to Nina Simone. I know for sure, even though I’ve listened literally hundreds of times, I still remain thoroughly moved by these performances. They are not timeless, they are time-stopping, time-suspending; sort of like holding your breath in the face of the force of raw nakedness and stunning beauty. I give you Nina Simone. 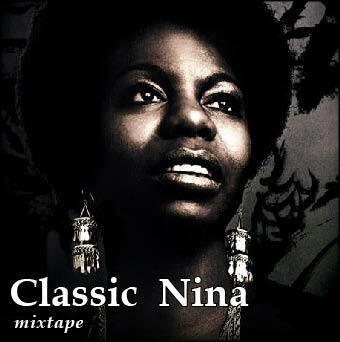 Classic Nina Simone!